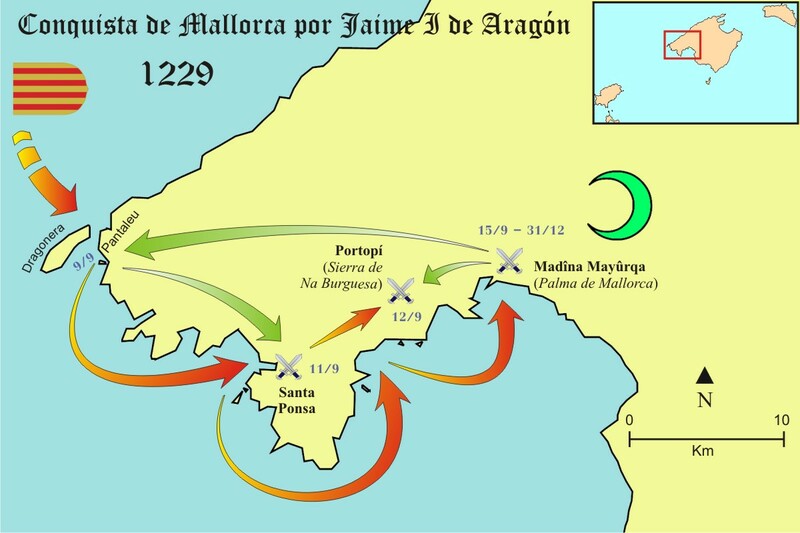 The Battle of Portopí was fought between the Almohad troops that occupied the island of Majorca and the Christian army led by King James I (the Conqueror) of Aragon. James aimed to annex Majorca to the Crown of Aragon in order to expand his domain. It was carried out at various points in the current Sierra de Na Burguesa (formerly called Sierra de Portopí), approximately halfway between the current resort town of Santa Ponsa and the City of Majorca. Guillermo de Montcada and his nephew Ramón led their men towards the enemy position, forcing the rest of the army to follow them in action. Uncle and nephew were thus locked in a fight with the hosts of the Muslim king of Majorca in the mountainous region between Santa Ponsa and Majorca. The Montcadas’ first attack against the Muslims started in the foothills of the mountains. The Christians initially appeared to have the upper hand but they were then surrounded by forces superior in number to theirs. The two nobles perished, along with others, in the ensuing struggle. James I, who was as yet unaware of the death of these men, followed the same path, advancing with the rest of the army, intending to join them and participate together in the battle. He encountered the enemy in the highlands. At the end of the day and after successive battles in various parts of the mountain, the king and his army defeated the Muslims (who withdrew to Majorca), eventually gaining a strategic position in the mountains, from which the capital could be seen.